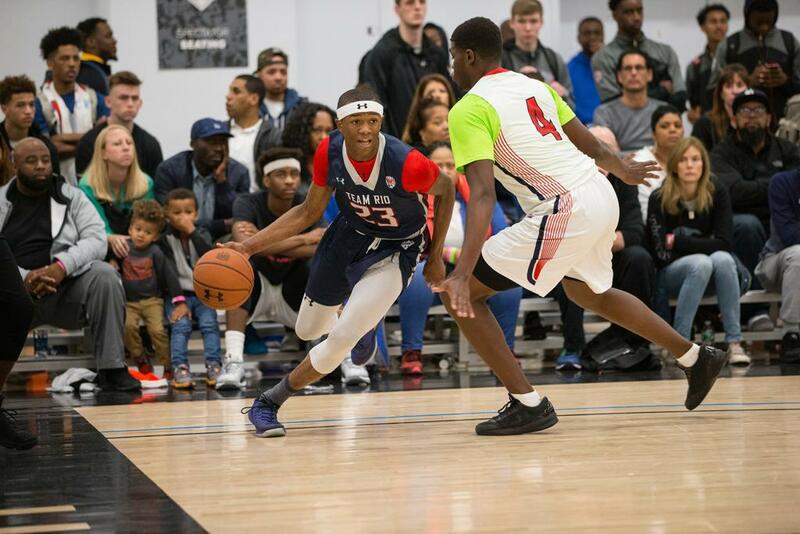 The third week in April is the first live period in the New Year and effectively the official kick-off of summer basketball. This year Under Armour returned to NYC for their opening while Nike and Adidas were stationed in Hampton, VA and Dallas, TX respectively. We had the opportunity to catch the first two days of the UA Association and witnessed a number of players who undoubtedly caught spectator's attention, including dozens of college coaches looking for the next piece to add to their puzzle in hopes of competing next March. Moses Brown | New Heights 2018 | The 7-footer continues to establish himself as one of the premier shot-blockers in the area. His timing and jumping ability make him a solid rim protector on the defensive end. When he catches anywhere near the basket, he finishes and/or gets fouled. He dropped 20 points, 11 rebounds and 3 blocks in a monster game against a fierce CBC team. Not to mention an almost perfect 8 of 9 from the field. 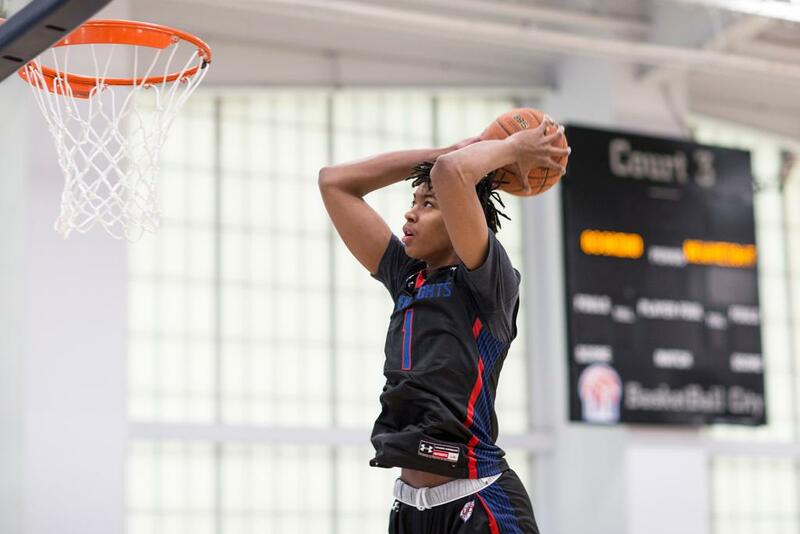 Sidney Wilson | New Heights 2018 | Wilson is no stranger to the UA bright lights, but his role on this New Heights team is much larger than in past years. When New Heights needs a bucket, he's their go-to-guy and consistently delivers. The 6'8 Wing Forward is as versatile a player as you'll see on any circuit. He led his team from a 16 point deficit against CBC with 23 points, 5 boards, and 4 assists. What impresses me most about Wilson's game is how under control he is under pressure. Expect more HM offers to flow after this breakout summer. Filip Petrusev | Connecticut Basketball Club 2018 | at 6'10 having a soft touch from three and the ability to put the ball on the floor is always a plus. Petrusev was unabashed when taking it to the rim against Brown and put in a few vicious dunks on his way to 13 points, 4 rebounds and 2 blocks. Petrusev already signed with Hartford and they will be happy to greet him on campus in 2018. Nicholas Guadarrama | Connecticut Basketball Club 2018 | Guadarrama is the player every coach wants on their team; he is 6'5 and physical on the boards and defense. He finished a tough loss against New Heights with 8 rebounds, splitting between 4 offensive and defense boards. He added 14 points to his effort and will be key to CBC's success in the Association this year. Jordan McCabe | Wisconsin Playground Warriors 2018 | McCabe is a crafty point guard with a lot of flare. He keeps his defender off balance with his strong ball handling and is a capable three point shooter. McCabe dished out 6 dimes to accompany 15 points in a back and forth battle with highly touted point guard Jared Bynum. Ryan Davis | Wisconsin Playground Warriors 2018 | Davis was a force in the paint at 6'8 200+. He was very efficient in the paint against DCBD, going for 19 points, and 9 rebounds on 6-13 shooting. He seemed to be at the right place at the right time whenever WPW needed a key bucket and was a large reason they arose victoriously. Daniel Oladapo | DC Blue Devils 2018 | Oladapo is a superior athlete who runs, rebounds, and plays defense. He is very effective crashing the offensive boards and had an efficient 13 points and 7 rebounds on 5 for 8 shooting to help his team stay in the game. Oladapo adds size and physicality to an already lengthy DCBD squad. Jared Bynum | DC Blue Devils 2018 | Jared picked up where he left off last year with a solid performance against WPW. A known scorer but he also showed off his point guard abilities with a solid 5:1 assist to turnover ratio. He coupled his 5 assists with 17 points in a very hard fought effort against WPW. Jawaun Daniels | Sports U 2017 | Daniels spent most of his night in the air, high above the rim. Whether it was catching alley-oops from teammates or slashing to the rim, Daniels was the highlight reel of the night. He also showcased his array of offensive moves by knocking down threes and mid-range jumpers to keep his team in the game. Daniels will have followers throughout the Association with this continued play. Nazreon Reid | Sports U 2018 | Reid showed up for Sports U in the second half in a big way. After being saddled with foul trouble in the first half, the 6'10 brawny center showed why he is among the top big men in his class by swatting shots and throwing down dunks to keep his team within reach. He finished with 12 points and 10 rebounds in a close defeat against a very talented Team Rio. Bryan Antoine | Team Rio 2019 | Antoine is ranked #14 (according to ESPN) in his class for a reason, and on the first day of the UA Association, he showed why. The 6'5 guard has a relentless scorer's mentality. His game high 19 points were spread out evenly between early in the game and down the stretch when his team needed them most. His junior laden team showed why they may have what it takes to make the final four in July. Jalen Gaffney | Team Rio 2019 | Gaffney is a perfect backcourt mate for Antoine. The slashing guard can handle the ball under pressure and breaks down the defense getting his teammates open and easy shots. Look for him to have a few break out scoring games as the season progresses. 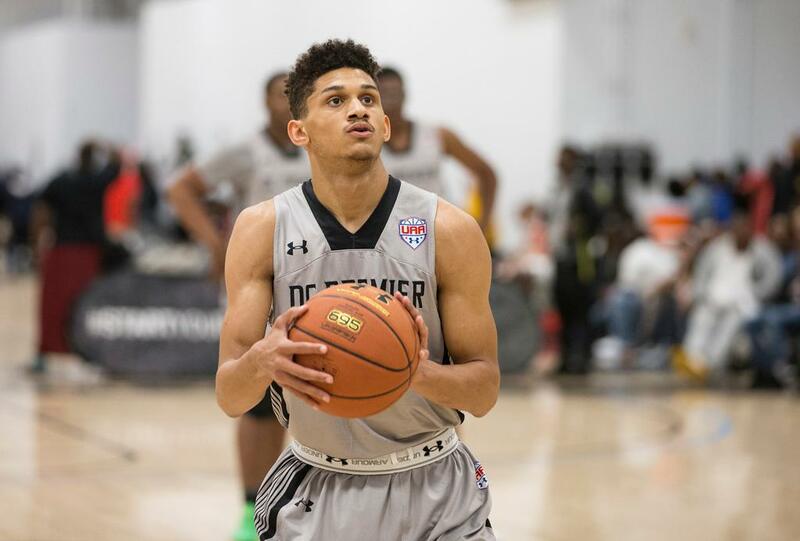 Prentiss Hubb | DC Premier 2018 | Hubb is a household name in the Association and for good reason. He held his own against one of the best point guards in the Association in Devon Dotson. His fourth quarter play was a large part of the reason DC Premier walked away with a victory. Look for Hubb to have some explosive games this summer. Saddiq Bey | DC Premier 2018 | By the time the Association is complete, Saddiq Bey will be on the names of a lot of coaches around the country. His 6'6 frame to go along with his offensive skill set make him an ideal college wing. He often took his man off the dribble for a quick stop and pull up or finished all the way at the rim without friction. Jermaine Harris | DC Premier 2018 | Harris is as physical as they come. He also can sprint the court as quickly as a guard can which is why he often is either finishing on the break or blocking someone's shot from behind. Look for him to thrive off the penetration of Premier's excellent guard play. Devon Dotson | Team Charlotte 2018 | Dotson is making a case to move up the ranks of top point guards in his class. When he gets a full head of steam going to his right, he's virtually unstoppable. What may be underrated is his tenacity after the ball on defense, he hounds his defender full court and never gives up on a play. He is the heart and soul of Team Charlotte and will be fun to watch this summer. Aaron Wiggins | Team Charlotte 2018 | Wiggins and Dotson easily make up one of the best back-courts in the association. Wiggins is a savvy 6'6 shooting guard who fills it up from everywhere on the court. He has an assortment of moves to get free from his defender and knock down his silky smooth jumper from deep or mid-range. He can also finish at the rim and had a number of impressive buckets against DC Premier.